Paying for a professional haircut can be very costly for most men. If you’re looking for a strong alternative, purchasing a pair of professional hair clippers and trimmers can be an appealing choice. It allows you or someone else to cut your hair without requiring pro training or having to book an appointment, thus saving you money. These hair clippers work by using rapidly moving toothed blades that create a scissor effect. Simply run it through your hair, and it will effectively cut through without any issues. You will have to consider both the power that the Clippers provide and also the precision they cut at. Look for clippers that feature high-performance motors, but are also designed with ergonomics in mind. Rotary motors are the most powerful but tend to be much bulkier. Magnetic motors are the fastest, but least powerful. And pivot motors have plenty of power but lack blade speed. You want a clipper with a good balance between performance and still be able to move it around with ease. On this end, there are cordless and corded clippers available. Accessories can be one of the major selling points of professional hair clippers or shavers for men, and many of them give you different functions like tapers, cleaning oil, and guard attachments. With size 000 Agion antimicrobial blades, this classic style hair clipper from Oster delivers consistent value. It comes in 5 different colors, including pink, brown, burgundy/black, velvet blue, and woodgrain. The innovative motor design is specifically made for easier maintenance, while the break-resistant housing can hold up to even the toughest environments. This clipper can cut through thick, wet hair as efficiently and smoothly as it can dry hair. It comes with a detachable blade, blade guard, clipper grease, cleaning oil and brush. It is designed to maintain easily. If you’re looking for a high-quality hair clipper that won’t break your budget, check out this model from Wahl. It comes with a full set of 8 attachments. This includes blades with 1/4″, 1/8″, 3/8″, 1/2″, 5/8″, 3/4″ 7/8″ and 1″ spacing. This wide array of extra tools gives the clipper unparalleled versatility and functionality. Also included in the package is a styling comb. It uses a powerful V5000 motor and has a variable taper and texture, with a lightweight design. 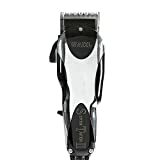 With its powerful V9000 motor, Wahl does not disappoint with this entry into their long line of efficient hair clippers. It features a full metal housing that is ergonomically designed and easy to wield. The blades are forged from a durable high carbon steel. It comes with 6 cutting guides, 2 styling combs, a cleaning brush, and oil. The adjustable blade lever gives it additional versatility, while the super close cutting blades deliver a smooth cut. With its unique motor and design, this haircut kit from Remington offers extensive efficiency for a low cost. 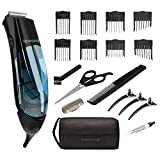 This 18-piece full haircut kit offers you all the tools you need to keep your styles fresh, without having to have a massive cleanup each time. 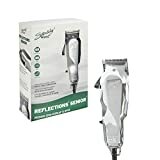 Its innovative dual motor system powers the precision Clippers as well as the vacuum suction abilities. It deposits all of the trimmed hairs into a collection chamber that is removable. This package comes with eight different blades as well as several other useful accessories. If you just need a cost-effective trimmer and/or clipper, check out this model from Wahl. It uses a powerful rotary motor that delivers professional efficiency and speed. The precision blades can snap on and off, making it convenient to switch out. This model comes in both white and black colors with a peanut style design on the housing. The compact size fits perfectly in the palm of your hand, making it very comfortable to use. It comes with a one year warranty. This unique product from Philips is very different from many other standard style hair clippers. It features 14 built-in length settings ranging from 0 to 19/32 inches. The head shaving attachment delivers a perfectly smooth shave, while the high-quality trimmer blades are very durable and will stay sharp over the long-term. All of the detachable parts are washable as well. However, the unique features are its 180-rotatable head. This allows you to reach even the most difficult of areas. For men looking for the right style and don’t want to break the bank getting a high-end clipper, this model from Wahl is the right choice. It is powerful, yet the motor runs cool, making it more comfortable to touch. The Variable taper and texture settings give it plenty of versatile uses for different styles. It comes with 8 combs in total and has zero-overlap adjustments on the blades. Coming in at a reasonable price, this combo from Wahl is excellent for men in need of both a clipper and a trimmer. The designer clipper offers professional quality and is easy to use with its high precision blades. It comes with 6 cutting guides from 1/8 inch to 1 inch. The trimmer is quite compact, measuring just 4 inches in length. It comes with its own guide attachments from 1/8th of an inch up to 1/2 inch. The compact size is surprisingly powerful and precise, leaving you with a fresh style and clean edges. If you’re looking for a solid midrange hair clipper, this model from Oster will get the job done right. It uses an innovative motor design, guaranteeing its life over a longer period of time, and easier maintenance. The housing is resistant to damage from any drops or tumbles, while the detachable blade measures a size 000. It comes with accessories including the blade guard, cleaning brush, lubricant, and clipper grease. 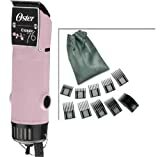 With a timeless design and powerful motor, this model from Oster is a solid piece, premium clipper. It comes with a size 000 blade and delivers exceptional power, and performance. The kit includes grease, oil, clipper blade, and a cleaning brush. The new and improved motor is powerful, yet operates quiet and is fairly cool. The cord is 8 feet in length and it comes in several style options including pink, woodgrain, powerline, silver, and red.